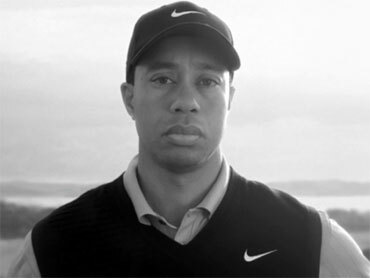 Nike aired a new TV commercial Wednesday featuring Tiger Woods and the voice of his late father, an edgy move that calls out his personal problems on the eve of his return to competitive golf. The ad aired on ESPN and the Golf Channel just one day before the Masters begins. Nike typically doesn't shy away from mentioning athletes' troubles in its ads, experts say. The company has stuck by other athletes with personal problems, such as basketball star Charles Barkley, who famously said in one ad he shouldn't be a role model.